Opening June 2019 | 30th St. & 10th Ave. In 2008, we initiated an advocacy campaign (“Save the Spur”) to save this last remaining section of the original rail structure. Over 10 years later, the protected, reimagined Spur finally opens to the public in 2019. For press information, contact us at press@thehighline.org. The Spur is public space made by people, for people. 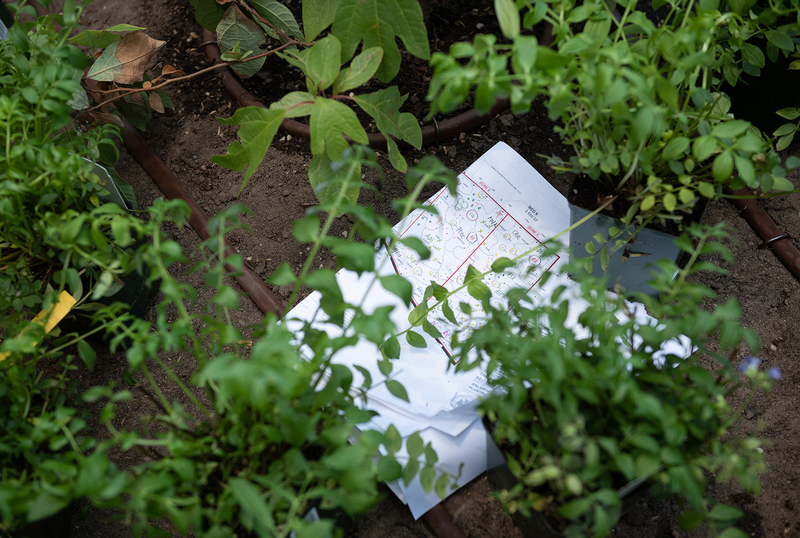 James Corner Field Operations (Project Lead), Diller Scofidio + Renfro, and Planting Designer Piet Oudolf—the same design team behind the first three sections of the park—listened to what visitors wanted when choosing the features for the Spur. That means: more space for public programming, more restrooms, more access points, more food, more art, and more plants. 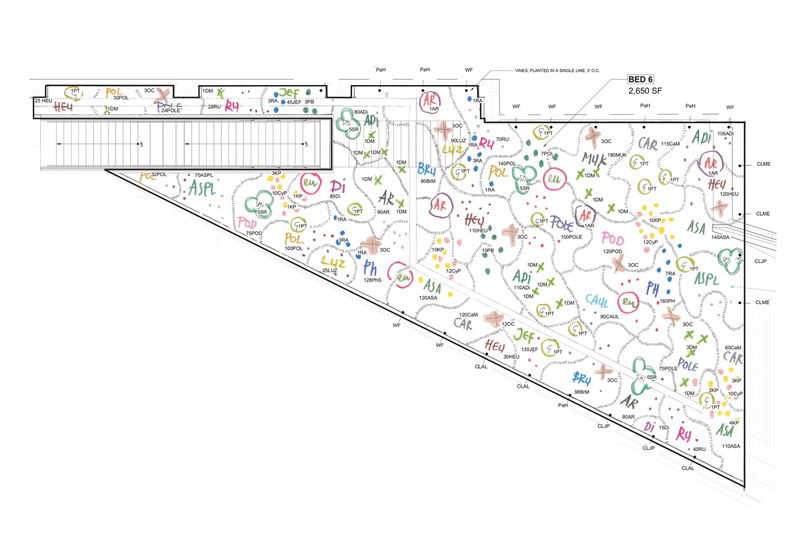 The flow of the space was designed to create moments of interactions—both between people and with the surroundings. The Spur unfolds in three parts—the Coach Passage, a planted threshold, and a large open piazza. With cathedral-like 60 ft. tall ceilings, the Coach Passage crosses through Coach’s global headquarters at 10 Hudson Yards. The passage is named in recognition of the Coach Foundation’s generous gift to the High Line’s capital campaign. 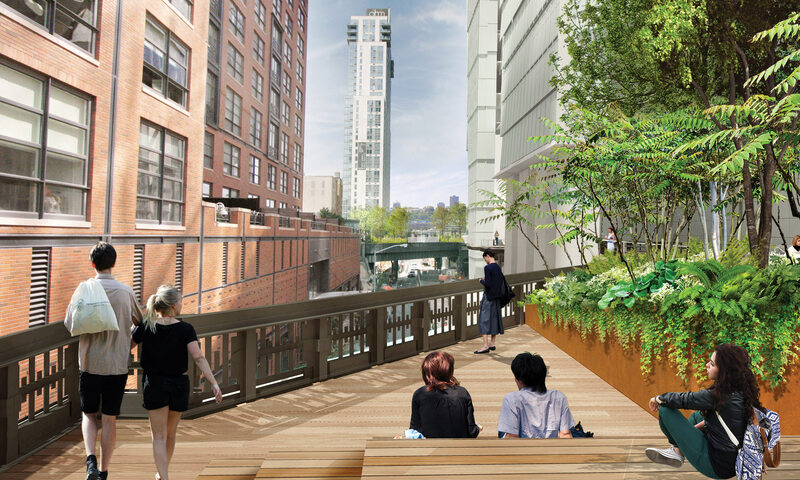 Primarily a hardscape, a series of planted balconies stretch out from under the building to provide visitors views of the sky, the surrounding buildings, and the other sections of the High Line over 30th Street. The iconic rails and benches of the High Line transition visitors from the walkway to the focal point of the Spur. Once through the Passage, visitors are greeted by two large “tilted” planters, rising like hills from the deck. 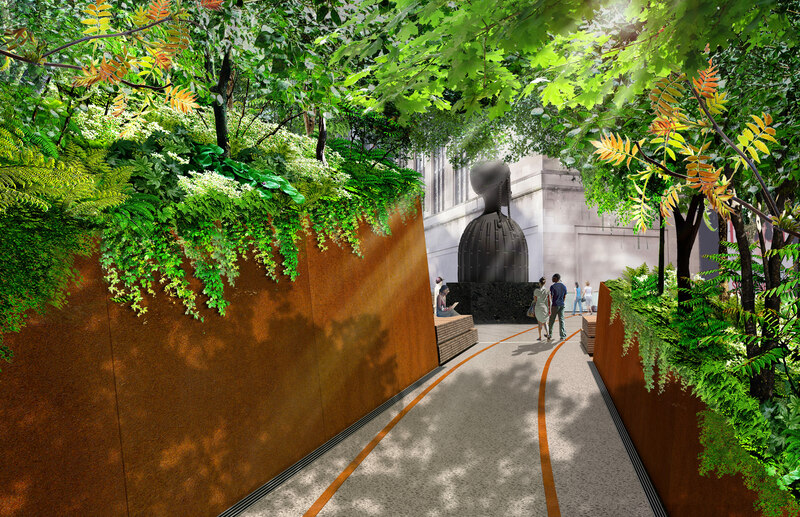 These create a dramatic planted threshold into the Spur and provide a lush wall of greenery after coming through the Coach Passage or from the streets of Midtown below. Finally, visitors arrive to an open piazza with panoramic views up and down 10th Avenue and 30th Street. The piazza retains the existing rail tracks that once led to USPS Morgan Processing and Distribution Center, reminding visitors of the history of the structure. Thanks to a series of cascading wooden seating steps on the east and west sides of the Spur, this new section provides critical space for hosting more people at our public programs and art events. 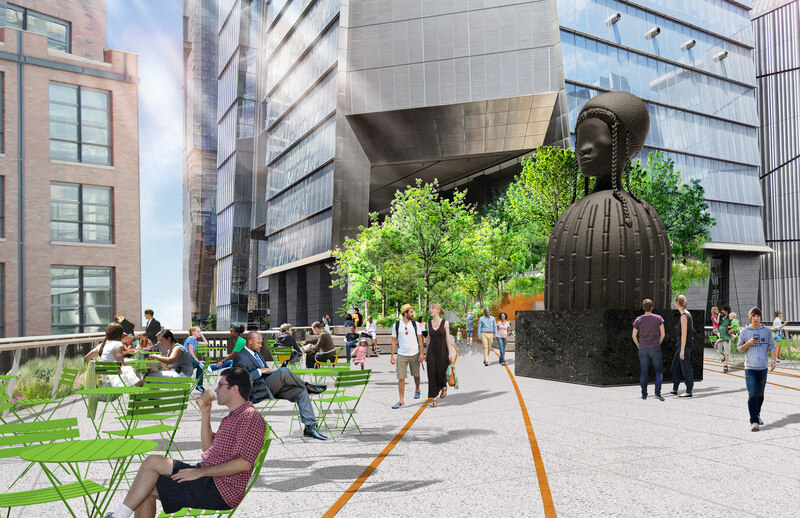 The Spur provides a home for a revamped High Line Shop; an open-air programming space that will expand the scope of our programs and number of attendees we’re able to welcome; new restrooms; and the Plinth, a dedicated site for monumental artworks curated by High Line Art. The Plinth, a dedicated space on the Spur for presenting monumental works of art, completes the piazza. 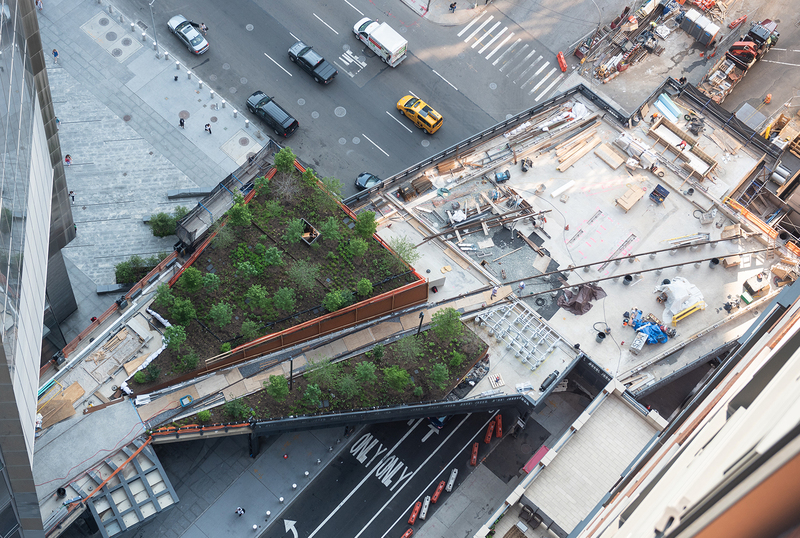 The Plinth is the first space on the park designed for art to be in concert with the unique design of the park, whereas the rest of the art program is installed in response to the High Line’s plantings and architecture. The Plinth offers viewers a chance to witness large-scale sculptures in the round and to experience the work from the ground, as well as on the Plinth itself. 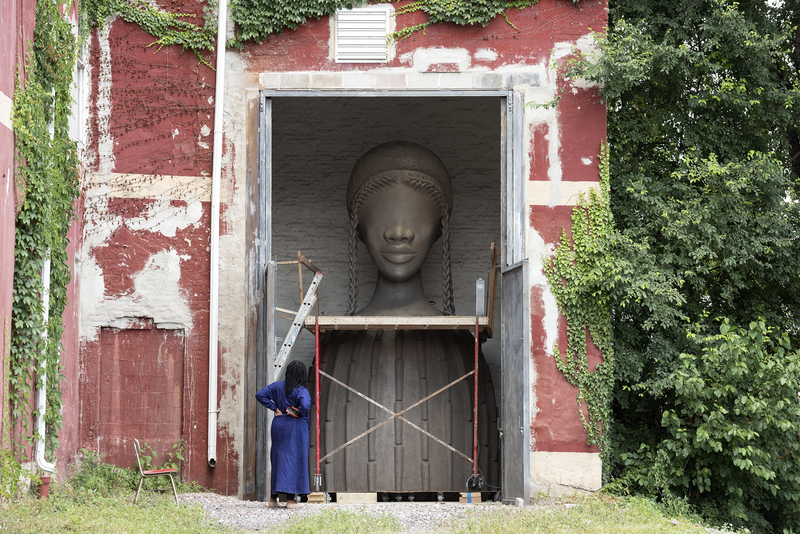 Simone Leigh’s Brick House, a tribute to Black female beauty, initiates the series of rotating Plinth commissions. Brick House is a 16-foot-tall bronze bust of a Black woman. The figure stands tall atop the Plinth, gazing down 10th Avenue. Her head is crowned with an afro framed by cornrow braids along her hairline that extend off her scalp into four braids, each ending with a cowrie shell. The sculpture references numerous architectural styles: Batammaliba architecture from Benin and Togo, the teleuk of the Mousgoum of Cameroon and Chad, and the restaurant Mammy’s Cupboard in the Southern United States. The design of the Spur gardens engages with the surrounding urban context with a “less is more” approach. The natural plantings are reminiscent of the original self-sown landscape and the rough allure of the High Line structure and rail tracks. 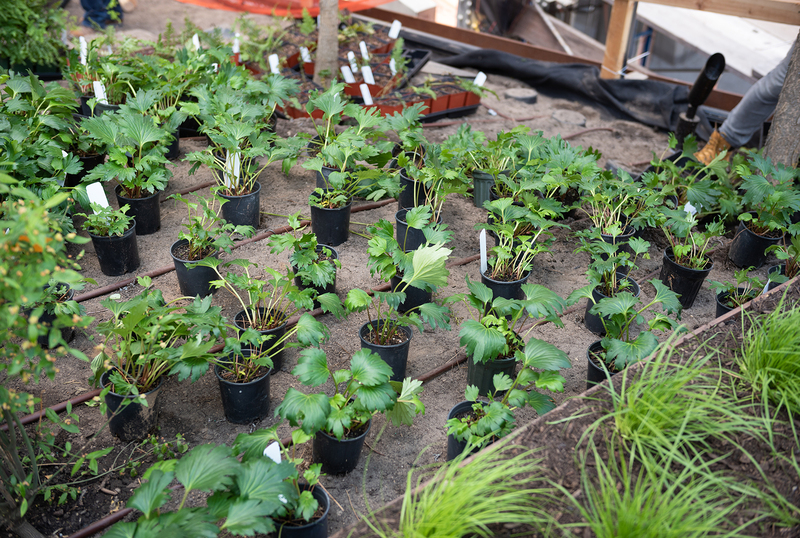 With a Northeastern woodland palette as inspiration, the Spur plantings comprise 8,500 perennials, 69 trees and shrubs, all new species for the park, and the largest planting beds on the High Line. Grasses, perennials, and a mix of popular clematis and wisteria vines hang from gardens along the Coach Passage, and flowering beds in the piazza include a mix of grasses and perennials punctuated by the theatrical changing colors of witch alder shrubs. Raised planters include hackberry, sweetgum, black tupelo, sassafras, orangebark stewartia trees, and strawberry bush. With its showy fruit, the strawberry bush will split open when ripe to reveal bright red seeds, bringing pops of color to the Spur in spring. Yellow lady’s slipper, a species of bog orchid, will attract native and wild bees, contributing to the complex ecosystem of the park. And a rare, protected American variety of hart’s tongue fern unfurls its strappy fronds—which are said to resemble the tongues of stags—and amplifies the unique composition of the Spur gardens. 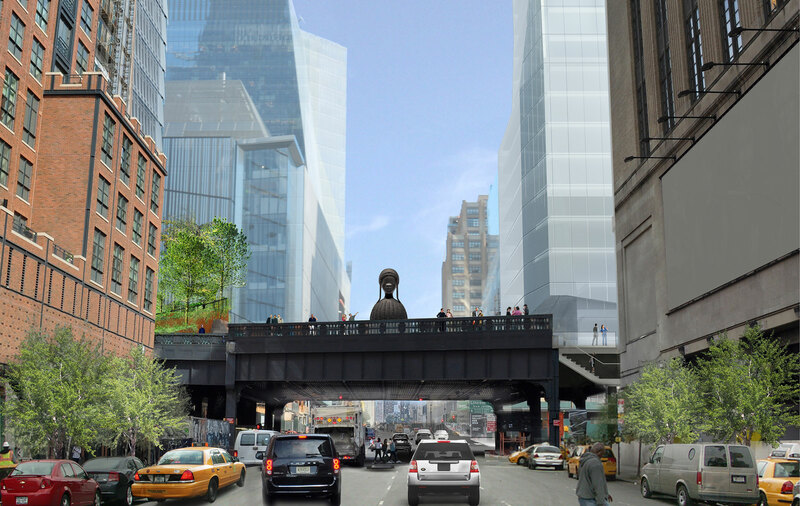 Public officials propose building an elevated freight railroad on Manhattan’s West Side as part of the West Side improvement initiative to eliminate street level traffic, attract large commercial structures, increase speed of freight, and improve public safety. The official opening of the High Line, a nickname for the railroad that would not become its moniker until the late 1980s. The Spur extension of the High Line is built to connect with the USPS Morgan Processing and Distribution Center on 30th Street. between 9th and 10th avenues. This direct connection allows freight trains to carry mail and packages to and from the upper-floor loading docks of the building. Thanks to the interstate highway, trucking, and the efficiency of shipping containers, transportation of goods by train plummets. The High Line rail stops operating below West 12th Street. The last customers wind along the route, allegedly carrying boxes full of turkeys; after this shipment, activity on the rail line ceases. It’s expected that the structure will most likely be torn down. But for now, they simply fall into disuse and disrepair. Robert Hammond and Joshua David meet for the first time at a community board meeting about the impending deconstruction of the High Line. They quickly realize they’re the only two interested in saving the rail structure from development and form Friends of the High Line to advocate for its preservation. 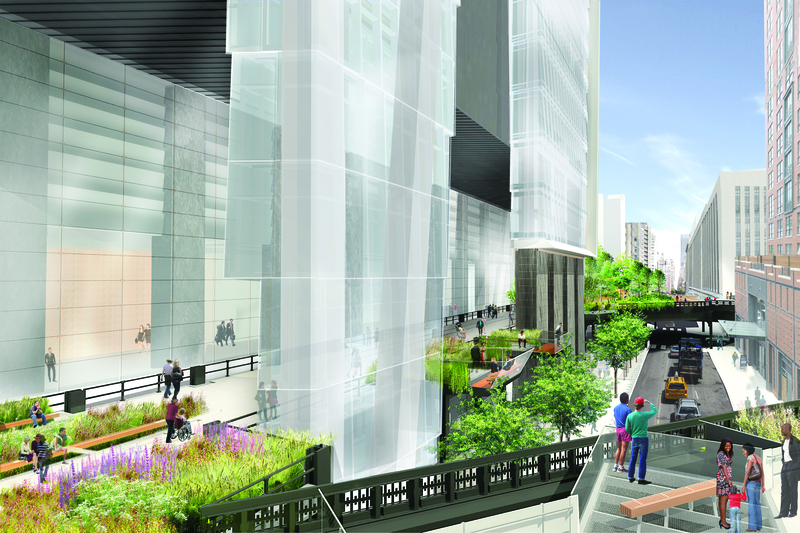 In April, Community Board 4 votes in favor of saving the High Line, with a 28 to 1 vote to win. 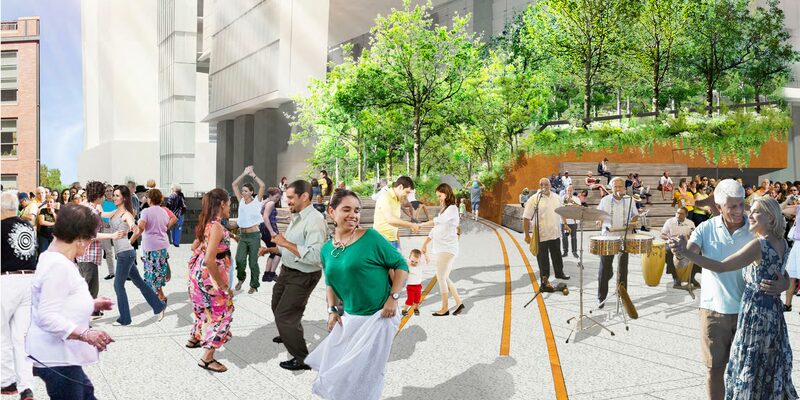 Friends of the High Line holds an ideas competition for proposals for what could transform the structure. Ideas range from roller coasters to mile-and-a-half long swimming pools. Groundbreaking begins for Sections 1 and 2. However, the Rail Yards portion remains in jeopardy. The developers of the Rail Yards state that it’s unlikely they’ll leave the Spur in place, as it casts a long shadow on the street, making it difficult to sell a building at its location. Friends of the High Line initiates an advocacy campaign (“Save the Spur”) to save the last remaining section of the original rail structure. Hundreds of people rally in favor of preserving the entire High Line at the Rail Yards. On June 9, we welcome our first visitors to the park at Section 1, from Gansevoort to 20th Street. On June 8, Section 2 opens between 20th and 30th streets. The City acquires the Rail Yards section of the High Line, and announces that the Spur will officially be saved. The opening of the Spur, made possible by public that worked so hard for its preservation. What’s next? The Spur and Coach Passage will be available to rent for private- and public-facing events starting in May 2019. The space is ideal for receptions, seated dinners, fashion shows, or pop-up events. 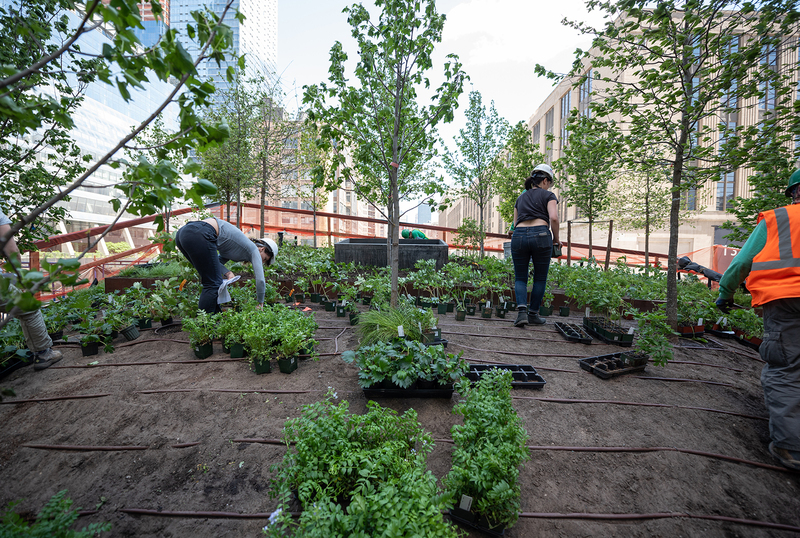 The High Line thanks its staff and volunteers for their continued work, and is grateful to a dedicated group of private and civic partners and the leadership of the City of New York and NYC Parks for their ongoing commitment. Thank you to all our supporters for making the Spur come to life.